My Sugahbabe 3 turns 2! She specifically requested for a yellow cake (as in a yellow-coloured cake - not a butter cake) with lollipops on top. cakes. Or clothes, or furniture. Or basically anything else for that matter. In my books at least. And then, lollipops? How cliched could you get for a kids' cake? Being the good mother that I was, I showed her lots of pictures of OTHER cakes which I though were more interesting, to cunningly steer her into choices that would perhaps be more exciting and challenging for me to execute. But nope, she would have none of it. Yellow it had to be. With swirly lollipops (she pointed to the picture on the iPad browser to make sure I got her point). The only change she made was to specify that it also had to have many other colours, like "green" and "pink", but it had to be a YELLOW cake. Great, now I had to do a gaudy, multi-coloured cake? Then again, what was a Mamma to do but deliver? Once I got over the initial disappointment of having to work with a colour I wasn't crazy about and a cake theme that was not really a theme, I started to plan. Along the way I found a way to make it interesting for myself by exploring how I could turn her birthday cake into a ruffle-ly one. In the end, I settled for these pretty and unique ruffles piped from buttercream (no fondant please!). Sugahbabe actually has a baby swimsuit that has ruffles just like these and in the same colours too. The birthday cake base is taken from a recipe from Rose Levy Beranbaum for a chocolate layer cake. Four layers of chocolate cake interspersed with strawberry buttercream (inspired by Sweetapolita - such an awesome blog!) with outer layers frosted and piped with plain vanilla buttercream. My decision to use a RLB recipe for the chocolate cake was a departure from my usual preference for a chocolate buttermilk cake base. I have to say that the chocolate buttermilk cake is a superior cake in every way - in terms of flavour, crumb and moistness. I found RLB's cake too crumbly and not sufficiently moist and springy. On the other hand, what it has going for it is a good fudgey flavour and (what made me try it in the first place) the fact that it really is very easy to make. For those who are inclined to try RLB's recipe, I would just say that ensuring that the cake is thawed completely before serving makes a world of difference. If it is just the slightest bit cold, it tends to be very brittle, dry and crumbly. At room temperature the texture improves dramatically and if you don't mind buttercream that is a bit runny, microwaving it just a little bit improves it even more. Finally, lollipops were fashioned out of fondant, as that would ensure I could colour them to match the buttercream. The little one got her wish after all! 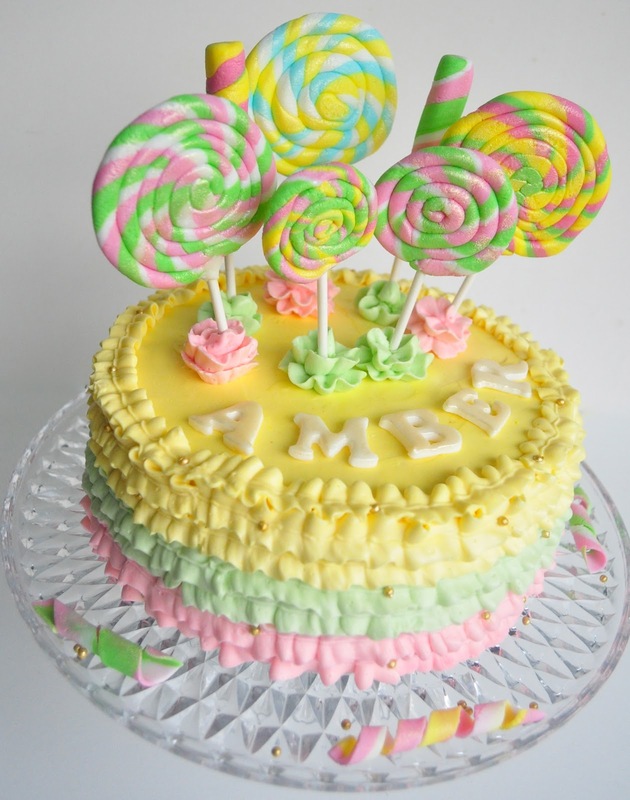 Yellow cake with lollies. But kids are hard to please. 2 days later, she is now asking me to make another BIG cake. I have to find a way to make her 2 year old mind understand this is a once in a year affair.